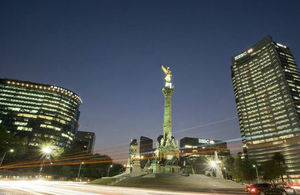 Programme Team in the British Embassy Mexico City, seeks to appoint research/consultancy firms to deliver a Scoping Study. As part of the 2015 Strategic Defence and Security Review (SDSR), a new £1.3bn Cross-Government Prosperity Fund to promote economic reform and development was announced. Its priorities include improving the business climate, competitiveness and operation of markets, energy and financial sector reform, and increasing the ability of governments to tackle corruption. These reforms will drive sustainable development in developing countries, and create opportunities for international business, including UK companies. The Prosperity Fund forms a strategic proportion of the UK’s total Official Development Assistance (ODA) commitment of 0.7% of Gross National Income (GNI). It represents a step-change in the ODA resources spent on assisting countries to grow and develop, which will help to make the world a more prosperous place. All ODA projects and programmes under the Prosperity Fund must comply with the International Development Act, meet the OECD Development Assistance Committee (DAC)’s criteria, are untied, and meet UK government transparency commitments on ODA spend. Proposals should be based on meeting the needs of host countries, with consideration for political will. For Mexico, priority sectors for the programme are to improve the business environment (including supporting the ability of partner countries to tackle corruption), support the implementation of the energy and financial reforms, and future cities (infrastructure, mobility and digitalisation). In addition to contributing to poverty reduction in recipient countries, we expect our programme interventions to create opportunities for international business, including UK companies. The programme will be designed in line with the Prosperity Fund’s Theory of Change, see Annex A. The Foreign and Commonwealth Office (FCO), through its Programme Team in the British Embassy Mexico City, seeks to appoint one or more research/consultancy firms to deliver a Scoping Study to collect commercial and economic analysis across these sectors and make clear, robust, evidenced recommendations to assist in the development of the new, multi-year programme. The Programme Team in Mexico intends to develop a series of programme proposals over 2016/17 in the following areas: business environment; energy; financial services; future cities and education. We intend to commission analysis in some of these areas through in-depth country analyses to identify which types of intervention(s) lead to maximum economic impact for Mexico and UK exports opportunities. The FCO has developed a diagnostic that provides high level strategic analysis of economic performance and constraints. We need to strengthen our analysis at subsector level hence we wish to commission short-term technical inputs for programme development and design, with appraisal and recommendations, this includes measuring and quantifying the contribution of the projects of the Fund to attain our primary and secondary objectives. Proposed interventions in each sector should be based on ‘high’, ‘medium’ and ‘low’ ambition. Impact and value for money will determine the likely success of approval for budget allocations. Each market intervention is expected to strengthen the wider UK portfolio through a coherent approach which will maximise ROI as a whole. The recipient of the analytical services will be the Foreign and Commonwealth Office. a) Primary benefit of the fund: how each sector contributes to economic growth and poverty reduction and what policies or interventions will help achieve it. b) Secondary benefit of the fund: what are the potential or actual commercial opportunities for the sector (market size, investment levels, demand for services, etc) and what is the UK share for them and what would be the potential gains implementing said interventions. c) There is particular interest to develop the following subsectors (proposals should address the following). • Financial Services: FinTech and its subsectors, reinsurance, asset management. • Future Cities: Infrastructure, digitalisation, mobility. • Business Environment: Security (including Cyber), Justice, Communications and cross cutting opportunities for business as a result of an improved business environment. We anticipate that the requisite sector specific expertise will potentially mean different suppliers provide the analysis for each sector. Please provide one proposal per sector or subsector. Reports will be short, factual and commercially focussed. They will be based on a) published secondary literature wherever possible; b) structured interviews with key stakeholders and; c) Primary sources from domestic and international statistics and databases. The interview arrangements will be designed in coordination with the FCO team. a) What are the specific barriers to growth in each area? c) What is the potential economic value of a) contributing to economic growth and poverty reduction in Mexico and b) potential economic gains for the UK; this would include analysis of direct commercial benefits to the UK. E.g. current UK market share, the potential for growth of the market, the potential for growth in market share. d) What evidence is there as to the effectiveness of potential programme interventions within each area against key indicators. The precise scope of the report will be developed together with the FCO’s relevant sector team. This will include: 1) refining and expanding on the questions above, and 2) provision of existing data sets and analysis. b) Monitoring and Evaluation – enabling the effective identification of outcomes and outputs, and the development of indicators to measure and baseline performance vital to robust monitoring and evaluation. c) Value for Money – ensuring a greater understanding of the costs and benefits of supporting different interventions so that resources are allocated to programmes that deliver greatest impact. d) Effectiveness – demonstrating a strong causal link between planned activity and intended outcomes and impact. We anticipate that a draft report will be provided no less than ten weeks following the commission, with a final report to be provided within 12 weeks of the commission. Please submit your application by the deadline of 21 October 2016 12:00hrs (Mexico time) to ukinmexico.ccep@fco.gov.uk. This work will be funded through a grant contract. See grant contract in Annex B. The successful provider will offer senior-level individuals with knowledge of sector in Mexico. The desired qualifications and experience are as follows – this should be set out within your bid: a) Qualifications in a relevant field (knowledge of forecasting techniques, econometric analysis, data mining, public policies, M&E, impact evaluations, etc. b) Prior experience in conducting consultancy/research of this nature; c) Good understanding of the Mexican economy, as well as political, development and commercial variables of each sector Knowledge of and access to relevant commercial stakeholders (within and outside of government) d) Knowledge of and access to relevant stakeholders who generate market data e) Examples that can be furnished of the consultant’s previous consultancy reports and studies independently and/or with a team. f) Expert and demonstrated level of writing and editing skills in English, to tight deadlines. 2 Some misunderstandings of the issues relating to delivery of the ToR and a generally low level of quality information and detail. Poor appetite to tailor when asked and so fails to meet expectations in many ways and provides insufficient confidence. 0 Complete failure to address the requirements of the ToR.